All text and images must be .375" from each final edge of the envelope. Images cannot bleed off the edge. Please note that we cannot print on the backside or flap of our standard envelopes. When Will I Get My A6 Envelopes? 5,000 and under A6 Envelopes: Ships or ready for pick up in 2 business days from proof approval. Over 5,000 A6 Envelopes: Ships or ready for pick up in 5 business days from proof approval. Your invitation or announcement will get noticed when it arrives in an A6 envelope printed by 48HourPrint.com. A6 envelope printing You can trust 48HourPrint.com for online envelope printing services that deliver excellent printed products at very affordable prices. Printed A6 envelopes are great on their own or as part of an envelope team! Use A6 envelope printing to create envelopes for announcements, invitations, photos, greeting cards and other uses, or include A6 envelopes with response cards inside our larger A7 envelopes or A9 envelopes. 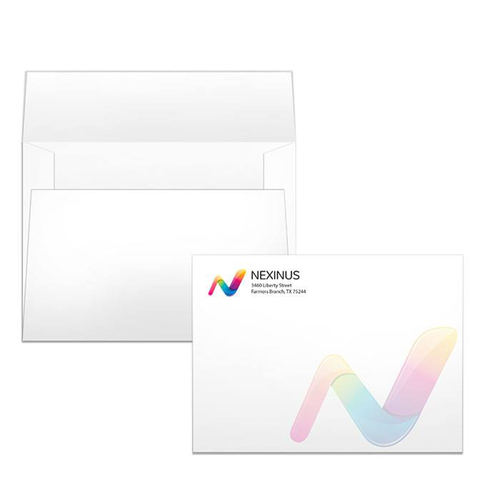 These multi-purpose 4.75” x 6.5” A6 envelopes look sharp with your full-color logo and return address. In addition to A6 envelope printing, our online envelope printing services include #10 envelopes, #10 window envelopes, #9 envelopes, A2 envelopes, A7 envelopes, A9 envelopes, 9x12 envelopes, and 10x13 envelopes. All of our printed envelopes are full color one side and are printed on laser and inkjet printer-compatible paper stock. For more envelope promotional tips, check out our envelope marketing ideas. Also review our envelope templates for layout guidelines that will help keep your print job on schedule.